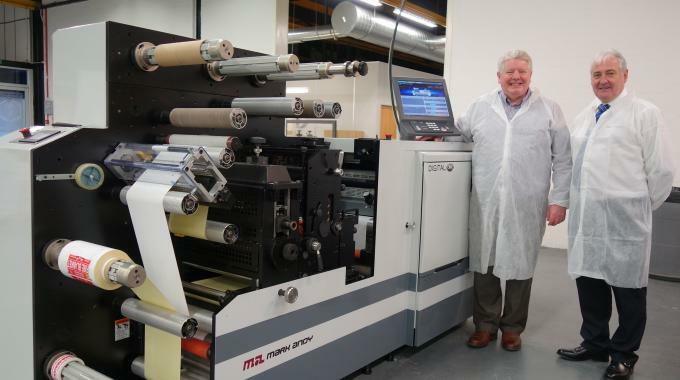 Scotland-based CV Labels has become the first converter in the UK install a Mark Andy Digital One as it adds digital label printing to its offering. CV Labels produces pharmaceutical, healthcare and medical labels. It moved into the pharmaceutical market in 2008 following a major decline in Scotland’s electronics sector. This includes strict GMP processes. CV Labels is certified to PS 9000:2016 from the Pharmaceutical Quality Group (PQG), ISO 9001:2015 from BSI for GMP and UL Certification for safety in product manufacturing. The decision to move into digital print was largely prompted by the ever-shortening run lengths that CV Labels is experiencing, with some jobs requiring as few as 100-200 meters of substrate. With customers requiring quality digital labels for pharma, Veitch knew he needed to look closely at what the market had to offer. The servo-driven Mark Andy Digital One has a 330mm web width and can handle a variety of substrates, without the need to use the full web width. It prints CMYK at 1200dpi at speeds up to 19m/min, while its flexo station can add spot color, varnishing, laminating or cold foil, before die-cutting and slitting. It is fitted with an air-cooled UV LED lamp, and requires only a single-phase power supply. CV Labels carried out extensive print trials on existing jobs with all of the manufacturers under consideration. The press sale was confirmed at Labelexpo Europe 2017, with the machine installed in November last year. To date the company has run PP, standard label papers and light card through the press on run lengths of 30-900m. Most recently, PP with a metallized backing has been in use. The Mark Andy Digital One press is part of a major investment program in technology at the company. It has extended its headquarters in Irvine, Scotland as it seeks to double sales by 2022. A new 7,000 sq ft production hall dedicated to digital print has been established, which will complement its flexo output, said Veitch. It has also invested in EyeC Proofiler inspection technology. CV Labels plans to make further investments in digital printing as part of its growth ambitions.